1. 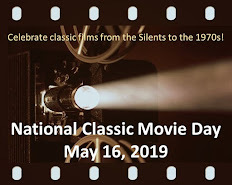 The Best Picture was All the King's Men, with Broderick Crawford winning Best Actor for his performance as Willie Stark. Olivia de Havilland won Best Actress for The Heiress. 2. 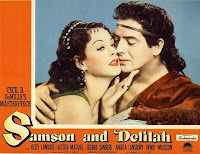 The top-grossing film at the box office was Cecil B. DeMille's Samson and Delilah. It made $11,500,000, which would equate to $122,872,000 in 2013. That's a big moneymaker by today's standards, but don't forget that the U.S. population was a lot smaller in 1949 and there were less movie theaters, too. That makes Mr. DeMille's feat all the more impressive. 3. The top box office attractions were: Bob Hope; Bing Crosby; and Abbott & Costello. Incidentally, Bob and Bing weren't in a Road movie in 1949 (their last one had been 1947's Road to Rio). 4. 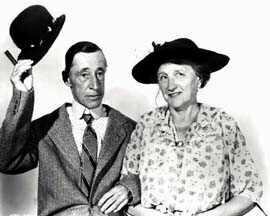 After supporting roles in The Egg and I (1947), Ma and Pa Kettle got their own movie--appropriately-titled Ma and Pa Kettle. It was the first of a nine-film series with a new installment appearing every year through 1957. Majorie Main played Ma in all of them and Percy Kilbride co-starred in the first seven. He retired from acting after suffering an injury in an automobile accident. 5. Future stars that were born in 1949 include Meryl Streep, Sigourney Weaver, Jeff Bridges, Pam Grier, and Sissy Spacek. 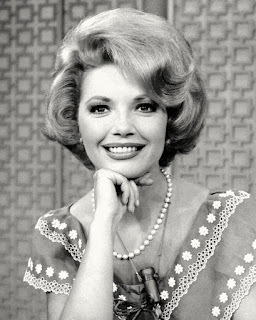 Film greats who passed away that year included Frank Morgan, Victor Fleming, and Wallace Beery. 6. 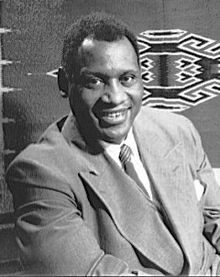 At the Paris Peace Conference, actor-singer Paul Robeson gave a speech in which he allegedly said that it was "unthinkable" for blacks to fight in a potential war against the Soviet Union. According to a 2011 article in the Smithsonian Magazine, an inaccurate transcript was released by the Associated Press and "historians would later discover that Robeson had been misquoted, but the damage had been almost instantly done." The House Un-American Activities Committee subpenoed baseball player Jackie Robinson, who testified that Robeson's comments, "if accurately reported, were silly." 7. Television became more prevalent, grew in popularity, and started to pose a threat to the film industry. The Sears & Roebuck catalog included television sets for the first time. RCA made great strides toward development of color TV (its color TV technology would become the U.S. industry standard in 1953). The Lone Ranger TV series made its debut on ABC and went on to become the fledgling network's first legitimate hit. 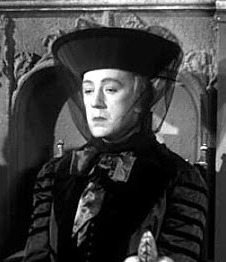 roles in Kind Hearts and Coronets. 8. Britain's Ealing Studios--which became known for its low-key, quirky comedies--released three classics: Whiskey Galore (aka Tight Little Island); Passport to Pimlico; and Kind Hearts and Coronets. ﻿9. Vittorio De Sica's Italian neo-realism masterpiece, The Bicycle Thief, was released in the U.S. and given an honorary Oscar. By 1952, it was voted the greatest film ever made in Sight & Sound magazine's first poll among film professionals. 10. Fred Astaire and Ginger Rogers appeared in their last film together: The Barkleys of Broadway. Wow - I didn't realize what an interesting year 1949 was. Thanks for sharing these facts. Now I can use them to impress family & friends at holiday parties. What an interesting snapshot of 1949, especially with its impact on cinema and television! Well done, Rick! Thanks, everyone, for the feedback. I picked the year at random and found so many interesting facts that I had to omit some to keep the list to ten. James Garner Faces a Fake Future in "36 Hours"